Sonoma Ecology Center’s educators are wowed by the huge success of this year’s Summer Science Camps. An outpouring of positive feedback from campers and parents alike has confirmed for us that we are on the right track. Based at Sugarloaf Ridge State Park and Sonoma Garden Park, our Summer Science Camps fill the summer days with outdoor activities that are science-based, educational and fun. 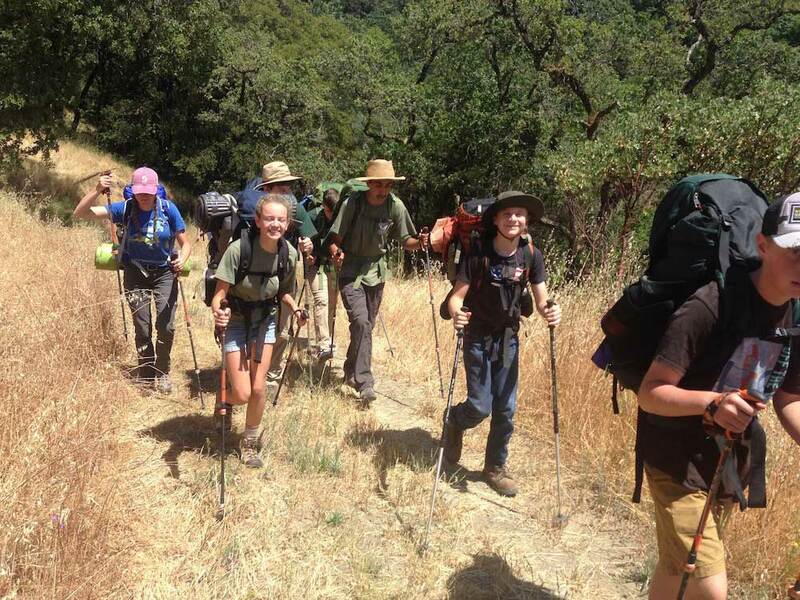 This year we offered six very popular camps, including Intro to Backpacking, where youths ages 10 to 14 joined Sonoma Ecology Center educator and naturalist Tony Passantino at Sugarloaf, spending three days and two nights learning essential backpacking skills. One mom told us her son returned from backpacking camp a more self-reliant kid. Our Creek Camp, for kids ages 8 to 12, explored Sugarloaf’s waterfalls, wildlife and Observatory. And at Sonoma Garden Park, three Harry Potter Camps led by Professor Hedgehog (a.k.a. Sonoma Ecology Center educator Holland Gistelli) focused on gardening and other magical outdoor activities, including one overnight camp-out complete with s’mores. Our efforts to make Sonoma Valley’s outdoors more accessible to the Latino community were a huge hit this summer with several Spanish-language hikes and activities – and capped off, in late July, by the first-ever Latina Family Camp, an outdoor gathering at Sugarloaf attended by dozens of Spanish-speaking families. In all, 75 people, most of them first-time visitors to Sugarloaf and many first-time campers, enjoyed two beautiful evenings in the outdoors. “The event was fabulous,” said Sonoma Ecology Center bilingual educator Alana Fichman, who organized it with help from partners at Sonoma County Regional Parks, REI, Bay Area Wilderness Training, Robert Ferguson Observatory, La Luz, and Vía Esperanza. “I have feedback forms from participants and rave reviews from all of our partners. We’re hoping to do more events like this going forward,” Alana said. This event was made possible by a State Parks grant – funding is needed for more events like it – and Alana didn’t forget to thank State Parks volunteers who “helped out a ton.” Our bilingual educator will continue to lead Sonoma Ecology Center’s bilingual program Senderos Naturales into the coming school year. As for the EnviroLeaders, our summer crew of seven teens has completed its season. Together they conquered the Advanced Backpacking Trek, mapped and removed invasive plants at Montini Preserve, and farmed alongside the community at Sonoma Garden Park. They even hosted “Eco-Night” at a Sonoma Stompers game, teaching everyday actions to combat climate change. Currently we are accepting applications for our next crew of EnviroLeaders. To apply or learn more, visit this page or email Tony at tony@sonomaecologycenter.org.